PODCAST: Part 2 of Chris C [@MiamiSixthMan] Come Get Sum [@CGSHere] interview of Tony Ortega [@TonyOrtega94], PLUS Phil Jones [@CallMePhilJones] discusses the new Los Angeles "Call Me" billboard intended to stop Scientology disconnection. Are critics becoming an "Anti Scientology Cult"? Phil Jones discusses the new "Call Me" billboard intended to stop disconnection blocked from the "Big Blue" Bld in LA. Tony answers more questions like: How did he come to write Paulette's story? How does he describe Marty rathbun in one word? Why Is warren Jeffs in prison but Miscavige free? Find the answers to these questions and more on this edition of Come Get Sum!!! VIDEO: Bill Maher Interviews Leah Remini about Scientology and the Aftermath on Real Time. Edited to substitute video from official Bill Maher Real Time Youtube channel. 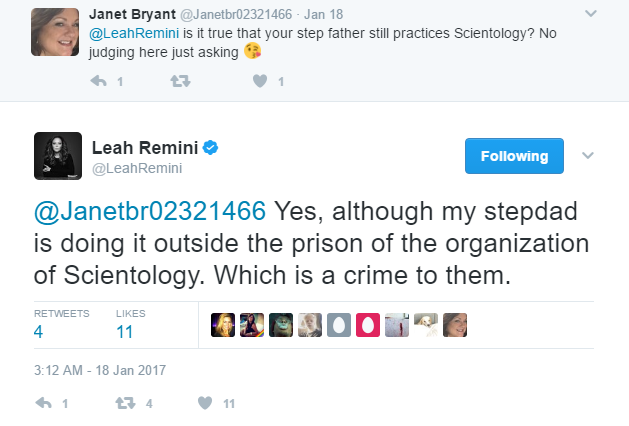 In his book, Going Clear, Lawrence Wright "called-out" the Cof$ Celebrities...Leah Remini has answered his call and then some! Leah is articulate, brutally honest and speaks from her heart. Guts, Guile and Gumption in Spades. As for would the cult cover up murder - Susan Meister ? Flo ? & others, too ! WTF is this would they cover up murder ? How many here can relate their personal knowledge of HILD MOLESTATION having been covered up time & time again ? Dozens. But, allow - at best - SO kids are poorly educated. Never mind how many times a college educated professional public person sat is front of a teenage SO ethics person who had NO education but was explaining how life HAD to be lived. And people wonder why the cult has people leaving it like rats off a sinking ship ? And in my mere 30+ years involvement in & with the cult I saw " celebs " handled with kid gloves time & time again. Sometimes as minor as sending an auditor out to the set to give sessions every day to some celeb. Or JT having a special place in the FH garage to park his car ( which was regularly washed & waxed by SO members ). Or celebs having a private course room. Auditor being available when celeb is ready to be audited in their room - not in an HGC. Endless list of perks the mortals never got- from rooms, to meals, to highly classed auditors, to personal course supervisors, etc. etc. And kha khan seems - like everything else - seemed to vary from org to org & time period to time period. Seen kha khan stave off a comm ev that was sure to end in a declare & another time seen it only lessen the results to treason. And I've seen KR's written on a kha khan - some ignored, some not. The thing I found most surprising about that interview was Leah saying she had to go into the org every day. I know that normal public have to do that but I somehow assumed celebrities could come and go as they please. For a while, Leah's mom was on staff. Was that what she was referring to? There are now eight Scientology and the Aftermath Bonus Videos. These appear to be the 5-minute "What Went Down" segments, each of which was broken up into 2-minute blocks with a 1-minute commercial break in between. No she said she was on course every day and she said it was the same for all scientologists including Tom Cruise. I think she exaggerates a lot. She often talks as though every scientologist was raised in it and joined the sea org, which is obviously not the case. However she definitely said she was in the org every day on course even when she was public and a celebrity. I do not think Leah exaggerates, much less "a lot." I believe she describes Scientology as she, personally, lived it. I also believe her experience as a "celebrity" was very different than that of other celebrities. I know of no other celebrity who was not only raised in the church, but also had been a member of the Sea Org. I think Leah was for that reason indoctrinated and inculcated MUCH more than any other celebrity, and therefore: (a) much more was expected of her in terms of KSW, being disciplined, etc. ; and (b) she was in fact much more disciplined regarding such things as course schedules. PODCAST: Leah Remini speaks with Ru Paul and Michelle Visage about Scientology and The Aftermath. In this episode Ru and Michelle are again joined by Leah Remini. They discuss scientology, her show Scientology and the Aftermath, spousal bathroom etiquette, and helping people. She is a member of a panel of stars on that show, headed up by Alex Baldwin. She doesn't air her views on Scientology on the show - it is light entertainment. All the stars are getting paid. It's a job. Why else would she be there? See link. Celebrities have various reasons for appearing on these types of shows. Leah's made clear she has no need to work but she does because she likes to. (As Geico would say "it's what she does"
Alec Baldwin is said to have a net worth of 65 Million. Do you really think he needs the money he gets to appear on Match Game? Oftentimes, the money the celebs do get from these shows they donate to charity (as is announced during show). I was aware she made plenty of money from her show, and it is in syndication and she is getting residuals. I just didn't think she was broke etc. but they don't do those shows out of the goodness of their hearts. Perhaps she wants to keep her face out there while she works out the details for a second season. Who knows. None the less, I don't begrudge her making a few bucks no matter how well off she is. Yeah, they do. I know you're speculating, so I'll offer some firsthand experience to help you out. I was working with a very famous person, and told them that I noticed a Budweiser logo. They told me that they were donating all of their pay, toward a certain cause. They do these shows out of the goodness of their hearts. PODCAST: Chris C [@MiamiSixthMan] of Come Get Sum [@CGSHere] interview of Aaron Smith-Levin [@GrowingupinSCN] about Scientology and the Aftermath, PLUS Paul Wysong discusses his lawsuit for pro-Scientology religious employment discrimination. Today's show starts with a conversation with Paul Wysong (A man allegedly (I believe him) fired for not becoming a Scientologist) at his WISE company job. Due to pending legal hearings this conversation is kept rather vague but I match his claims with several other claims just like his! Aaaron Smith-Levin (As seen on Scientology: Aftermath and his Youtube Channel: Growning Up In Scientology) talks about being on aftermath, How leaving Scientology has been a positive for him, Disconnection and much more!! What is a WISE Company and why are they making employees become Scientologists? Why was Aaron's wife, who is already declared a SP, not on Aftermath? Are SP's doomed to roam the Earth unclear? Find out the answers to these questions and much more on Friday's edition of Come Get Sum!!!! 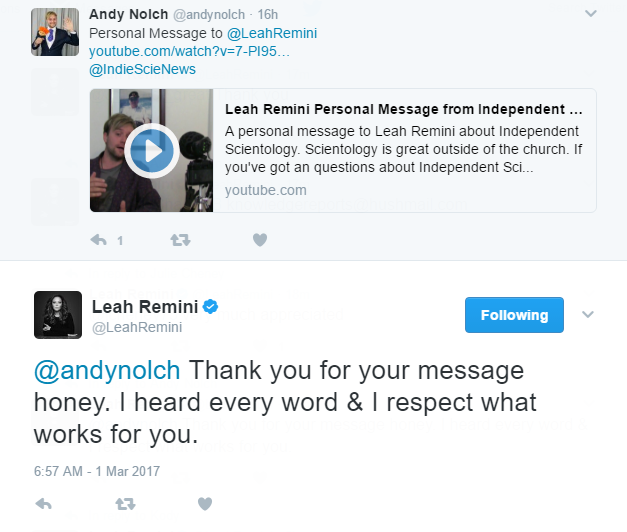 Message from Independent Scientologist Andy Nolch to Leah Remini, and Leah's response. Irony Alert: Leah Remini to play psychotherapist in new NBC series "What About Barb?" NBC has found the Barb that “What About Barb?” will be about. Jessica Gunning will play the titular character in the pilot that follows a psychotherapist who tries to cut ties with her most overbearing patient, but is unsuccessful and gains an annoying family member in the process. The project is based on the 1991 film “What About Bob?” starring Bill Murray and Richard Dreyfuss. Leah Remini will play Suzanne, Barb’s therapist. Intelligent, put-together, professional and uptight, Suzanne is a renowned psychotherapist and a NY Times best-selling author of the book “Baby Steps” — a book she wrote to help her get over her own divorce. Remini is also behind successful A+E docuseries “Leah Remini: Scientology and the Aftermath.”. Scientology And The Aftermath's Leah Remini Just Landed A New TV Comedy Playing A Psychotherapist. Leah Remini still may be on her crusade against Scientology, but that doesn't mean she has to step away from acting. The actress just scored herself a new gig alongside actress Jessica Gunning for an NBC pilot based off a classic comedy. The two will join forces as they try to recreate the magic of 90s film What About Bob? with a new take: What About Barb? What About Barb? is meant to be a genderbent small screen spin on the aforementioned 90s comedy that starred Bill Murray. For those who haven't seen that film, it features Murray as Bob, who accompanies his psychiatrist's family on a vacation. This television pilot will take a bit of a similar direction as psychiatrist Suzanne Marvin (Leah Remini) tries to sever ties with her overbearing patient Barb (Jessica Gunning) only to gain her as a family member. If the pilot is looking to follow in the footsteps of its predecessor, we should all be very excited.